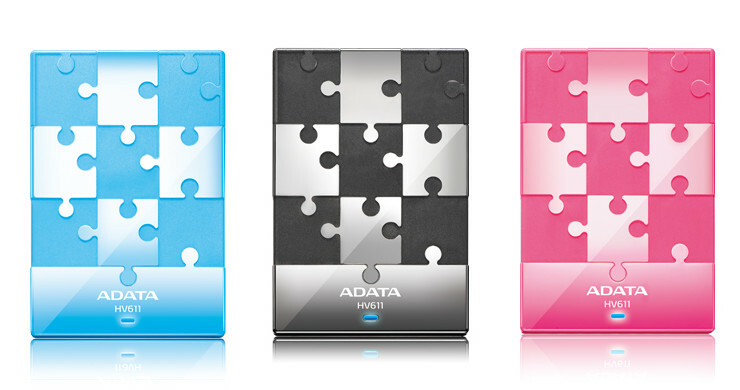 Taipei, Taiwan – June 20, 2014 – ADATA™ Technology Co., Ltd., a leading manufacturer of high-performance DRAM modules and NAND Flash application products, today launches the HV611 USB 3.0 2.5” external hard drive. With a simplistic design, vivid colors, and unique puzzle patterns, the HV611 can present your style effortlessly. Its compact size allows you to carry it easily wherever you go. The HV611 applies the SuperSpeed USB 3.0 interface, which greatly improves the efficiency of data transfer compared with USB 2.0. Featuring a unique puzzle design, the interlocking shiny and matte puzzle piece lines present an eye-catching style. With a bright blue LED indicator, users will know the status of data transfers. The HV611 has capacities of 500GB and 1TB and is available in 4 color choices – cool black, starry white, shining blue, and hot pink. Purchasers of the HV611 are eligible for free downloads of ADATA’s proprietary OStoGo and HDDtoGo software, and enjoy the service of a 3-year warranty, ensuring greater reliability, security, and convenience. The HV611 is available through selected retailers and distributors for the MSRP of £41.99 for 500GB and £55.99 for 1TB.